February 28. I’m sitting in the basement of Guyot Hall, grinding dried algae with a mortar and pestle. 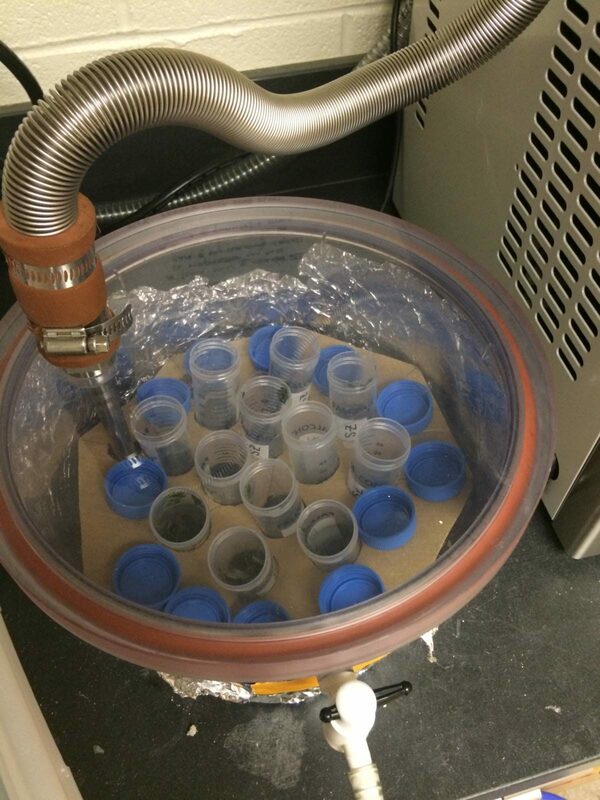 Vials of algae in the freeze-drier – the first stage of analysis. At this stage, Caulerpa racemosa, the Green Grape Alga, no longer looks its name. In its natural habitat, Caulerpa’s short stalks bob in the water like clumps of balloons. Its round “leaves” are clustered around the stalks just like green grapes, if grapes were the size of pinheads. But by now I’ve freeze-dried these samples so they are shriveled and stiff, and once I’m done grinding them, the plants are reduced to a uniformly fine olive-green powder. This is what science looks like for me this winter. It’s not simmering test tubes or even statistics: just the incremental alchemy of water samples and crusty Caulerpa into numbers with the potential to tell a reef’s story. At a recent job interview, I was asked to talk about the lessons I’ve taken away from my research. One image that came to mind was that of my water samples: the hundred or so bottles that I filled in the ocean in Bermuda, carried back to Princeton in a cumbersome cooler, and spent much of this winter analyzing in the lab. Lined up in the freezer, the bottles are identical but for their labels. These bottles contain the most important data I have – and, for months, they’ve looked exactly like identical bottles of water. But identical they are not. 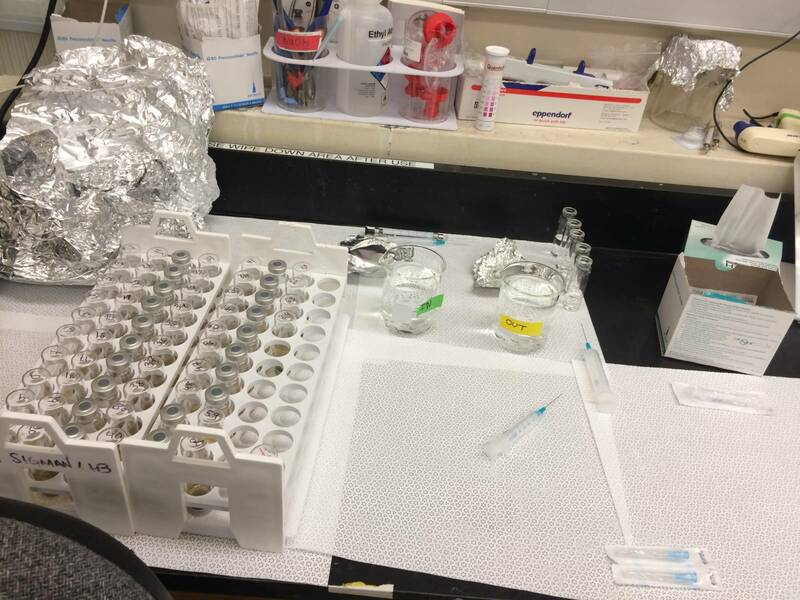 After many a long lab day, I have numbers to crunch – each bottle associated with nutrient concentrations and nitrogen isotope data that begin to tell the reef’s secrets. These nutrient data represent the raw materials available to plants and animals on the reef. The isotope data help determine where those raw materials have come from, and what organisms are using them. In my thesis, I am studying how nutrient pollution coming from human sewage changes the geochemistry of Bermuda’s reefs, affecting reef organisms, like Caulerpa, that use those nutrients. This has the potential to shift the ecosystem’s balance: nutrient enrichment puts reef-building corals at a disadvantage, threatening the intricate, biodiverse communities – of anemones and angelfish and everything in between – that corals support. A set of water samples mid-way through vial injections for isotopic analysis. This semester, each PCUR will interview a Princeton alumnus from their home department about his/her experience writing a senior thesis. In Looking Back on Undergraduate Research: Alumni Perspectives, the alumni reveal how conducting independent research at Princeton influenced them academically, professionally and personally. Here, Zoe shares her interview. 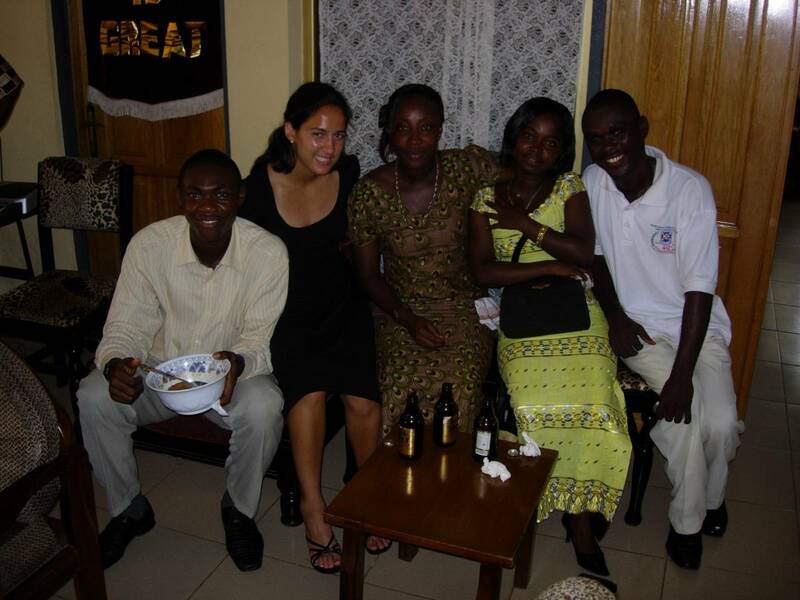 Kristin with her hosts at a church service in Accra, Ghana, in 2008. At Princeton, Kristin Schwab ‘09 was a year-round student-athlete: a striker on the field hockey team, a midfielder on the lacrosse team, and an Ecology and Evolutionary Biology major with interests in medicine and global health. Her independent work on Ghanaian vaccine policy took her halfway around the world, and ignited a passion that continues to shape her work and career. And what is classroom learning good for, anyways? It is Tuesday morning. From the back of the classroom, I squint at the pictures of fish being projected on the board, and scribble in a spiral notebook. Queen angelfish: yellow ring on head, I write as the instructor describes the species’ habitat. She flips to the next slide. Townsend angelfish, I write, less common. A school of doctorfish (Acanthurus chirurgus) near one of the reefs I studied last summer. Doctorfish can be identified by the dark vertical bars lining the middle of their bodies. Slipping into the room, with its rows of desks, overhead projector, and professorial monologue – had felt like donning my own old, well-worn clothes. Sixteen years of traditional education have made this role as a student a familiar one. Yet this time, the circumstances are unusual, and entering the room as a pupil feels suddenly bizarre. It is mid-June, my third week on the island of Bermuda. Just down the hill from this classroom, the turquoise ocean plays against the research station dock. I am at the Bermuda Institute of Ocean Sciences to conduct a field research project assessing how polluted groundwater affects the chemistry and ecology of near-shore coral reefs. Over breakfast, someone had mentioned that a summer course instructor would be lecturing her class on fish identification today. I have been planning to conduct fish surveys on the coral reefs I am studying, but (rather critically) first need to learn to identify all the fish. The timing of the lecture couldn’t be more perfect, so here I am: hunched over a table in the very back of the classroom, listening and scribbling notes like my thesis depends on it. Fieldwork is often – at least in my experience – a perfect storm of challenge. Our time is limited, our advisers are distant, and we are immersed in unfamiliar cultures and experiences. Fieldwork has given me some of my most dramatic and overwhelming challenges – and also my most transformative learning experiences. Yun-Yun (center) with her interview enumerator (right) and friend (left) in a Dai temple in Xishuangbanna. I was one of many rising seniors who spent time in the field this past summer, collecting the data which will (if all goes according to plan) serve as the foundation of my senior thesis. I wanted to understand better how fieldwork shapes other seniors’ personal growth and research paths. This week, I sat down over tea with Yun-Yun Li and Alice Frederick, who each did fieldwork last summer in foreign cultures and outside of their mother tongues. We talked about the experiences and lessons we have brought back to Princeton after spending the summer in the field. Yun-Yun is an EEB concentrator researching the social, economic, and environmental factors that affect rubber farmers in southern China. Here, we talk about how she found her research question and worked through self-doubt in the field.